A wise man once said, "If you can't laugh at yourself...then you're probably an idiot." Words to live by, for sure. Words to live by, especially when one's favorite hobby involves reading about people who can fly, buying toys depicting people who can fly, and going to conventions where people dress up as...well, people who can fly. So in the spirit of laughing at myself and everyone involved in the comics hobby, today I'd like to run down a list of a few satirical books on comics and the hobby that I've enjoyed over the years. These won't be official reviews, per se, but more like suggested reading. In any case, let's start. First, if you want to laugh at this ridiculous and wonderful hobby of ours, then you have to start with Mark Evanier's fantastic three-book series collecting the best of his columns written for Comics Buyer's Guide. Evanier is one of my favorite comics people in general, and his blog is always informative, thought-provoking, and flat-out funny. Sometimes all at the same time. And the content of these collections is no different. In the series, Evanier talks about a wide range of topics, including humorous tales of his old childhood comic book club, the insanity of modern comics numbering, and an incredibly informational (and, frankly, required) piece on Bob Kane, Bill Finger, and the creation of Batman. 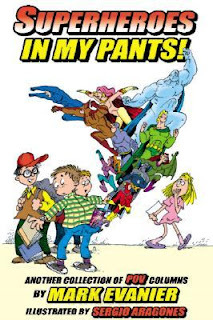 The three books, entitled, Comic Books and Other Necessities of Life, Wertham was Right!, and Superheroes in My Pants, are all available on Amazon and at Mr. Evanier's Web site. Next up is another collection of columns, this time from comics writer and fan favorite Gail Simone. The collection of Comic Book Resources columns, called You'll All Be Sorry (or, YABS) is a skewering of the comics industry at large, at creators in particular, and at fans in general. YABS is not good, clean fun, but it is good, mean fun. From Wizard to the various comics news sites online, no one in the industry is left alone--not even Alan Moore's seminal Watchmen escapes Simone's wrath. It's all done in jest, of course, but Simone's acerbic wit often leads to brutal satire. This book is tough to put down once you delve into it, and I highly recommend checking it out. Finally, we have an interesting magazine that I actually just found this past weekend called Comic Book Nerd, from the great TwoMorrows Publishing. 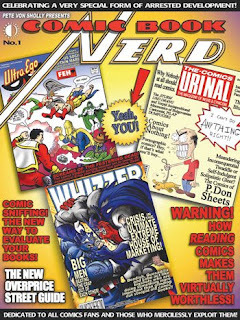 Nerd is a straight-up satire of the comics press, as the book contains mock pages from Wizard, Comics Buyer's Guide, The Comics Journal, and even some TwoMorrows titles. Fans of any of these mags should get a few laughs at the satire, but with an in-store price point of nearly nine bucks and a page count of 64, it's satire that doesn't come cheap. However, you can check out a free 16 page preview of the book on TwoMorrows' site, right here, and if you buy directly from the publisher, the book is half off! So, in conclusion, a Public Service Announcement: Remember that it's okay to laugh at yourself and to poke fun at other fanboys and fangirls from time to time. That's all for today--Happy Friday, everyone!